Born in 1987 in Baranquilla, Columbia. Lives and works in Brussels, Belgium. Being very fond of food and enjoying travelling, he began studying gastronomy. Various experiences as a chef in large hotels in South America. - 2009: He takes his most life-changing trip, during which he meets his wife. - 2013: Moves to Brussels – his constant need to share his vision of the world instinctively pushes him towards photography. - 2016: Exhibits La Stroet at the Hangar and publishes the book of the same title. - 2017: Founder of the collective Raw7. The young Belgo-Colombian Jorge Hortua is a member of Raw7 and has made Brussels into his laboratory. He produces personal, masterful street photography. Jorge Hortua has developed his own particular artistic vision, inspired by the city of Brussels and its important folk culture. He believes that a city is a living organism with its own identity, peopled by persons seeking a place to belong. You come to Brussels to become someone, and this city has the resources to make that dream come true. After the series La traversée du miroir and his work as a street photographer in black and white, Jorge Hortua spent some time, as part of the theme of PBF03, haunting the capital’s food markets, which he sees as being the beating heart of any great city. 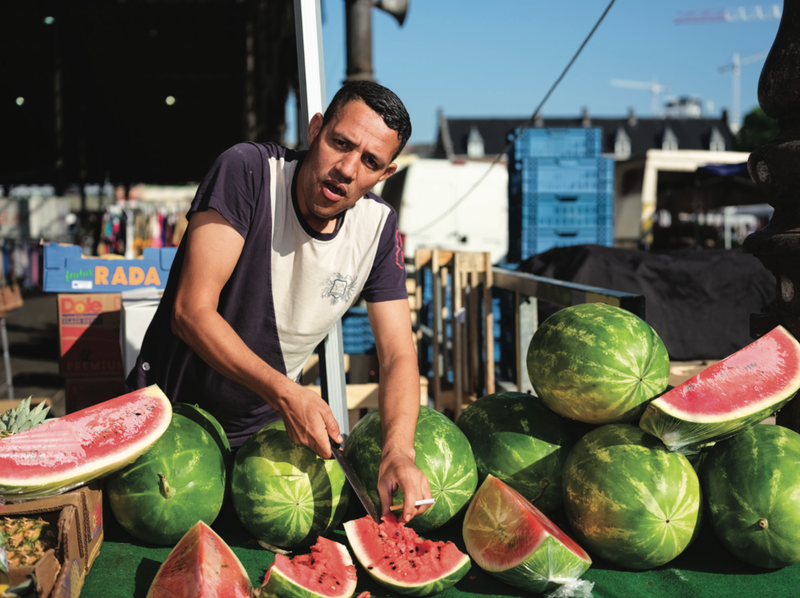 “I’ve always said, if you want to get a clear idea of what a city has, take a walk round the markets”.A vivid, brightly coloured vision of Brussels.